Assistant Professor Madhab Neupane has spent his career learning about the quantum realm and looking for these new materials, which are expected to become the foundation of the technology to develop quantum computers and long-lasting memory devices. These new devices will increase computing power for big data and greatly reduce the amount of energy required to power electronics. Big companies recognize the potential and they are investing in research. Microsoft has invested in its Station Q, a lab dedicated solely to studying the field of topological quantum computing. Google has teamed up with NASA on a Quantum AI Lab that studies how quantum computing and artificial intelligence can mesh. Once the quantum phenomena are well understood and can be engineered, the new technologies are expected to change the world, much like electronics did at the end of the 20th century. Neupane’s discovery, published today in Nature Communications is a big step in making that reality happen. “Our discovery takes us one step closer to the application of quantum materials and helps us gain a deeper understanding of the interactions between various quantum phases,” Neupane said. The material Neupane and his team discovered, Hf2Te2P – chemically composed of hafnium, tellurium and phosphorus — is the first material that has multiple quantum properties, meaning there is more than one electron pattern that develops within the electronic structure, giving it a range of quantum properties. Neupane’s research group is using its specialized equipment for advanced-spectroscopic characterization of quantum materials to develop their work further. “With the discovery of such an incredible material, we are at the brink of having a deeper understanding of the interplay of topological phases and developing the foundation for a new model from which all technology will be based off, essentially the silicon of a new era,” Neupane said. This study was funded by the Air Force Office of Scientific Research and was conducted in collaboration with Tomasz Durakiewicz from Los Alamos National Laboratory, Raman Sankar and Fangcheng Chou from National Taiwan University in Taiwan, Peter Oppeneer from Uppsala University in Sweden, and Dariusz Kaczorowski from Polish Academy of Science in Poland. 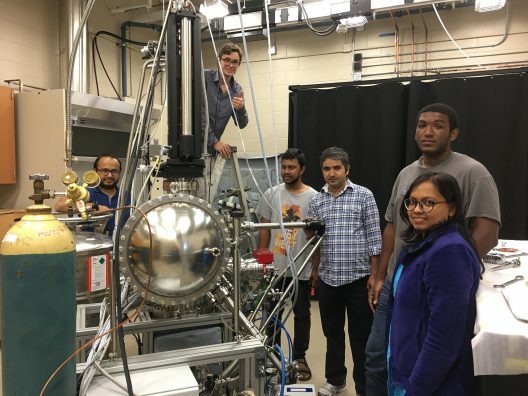 Neupane led the team of researchers that included UCF graduate students M. Mofazzel Hosen, Gyanendra Dhakal, Firoza Kabir, and Christopher Sims, and undergraduate student Klauss Dimitri. Neupane came to UCF in 2016 after completing postdoctoral studies at Princeton University and Los Alamos National Laboratory. He has been part of the frontier of quantum materials research since 2011.